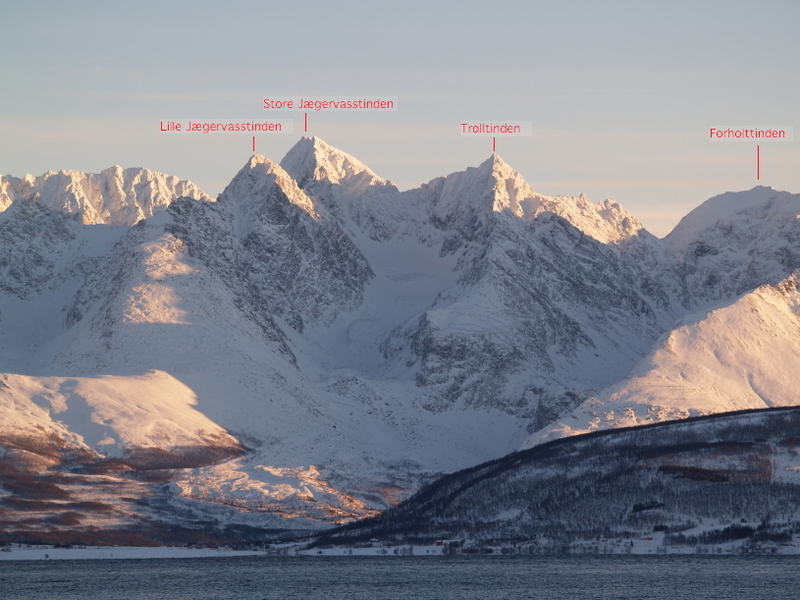 Jægervasstindene as seen from Ullsfjorden. First ascent of Lille Jægervasstinden: Elizabeth Main (UK), Emil Imboden and Josef Imboden (CH), August 8th 1898. First ascent of Store Jægervasstinden: Geoffrey Hastings, William C. Slingsby, Walter Perry Haskett-Smith (UK) and Elias Hogrenning (N), July 1898. First ascent of Trolltinden: Geoffrey Hastings (UK) and Elias Hogrenning (N), 1899. First ascent of Forholttinden: Elizabeth Main (UK), Emil Imboden and Josef Imboden (CH), August 13th 1898.